A quest to find something new by excavating the "deep time" of media's development-not by simply looking at new media's historic forerunners, but by connecting models, machines, technologies, and accidents that have until now remained separated. Deep Time of the Media takes us on an archaeological quest into the hidden layers of media development-dynamic moments of intense activity in media design and construction that have been largely ignored in the historical-media archaeological record. 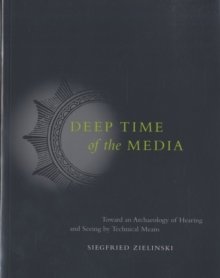 Siegfried Zielinski argues that the history of the media does not proceed predictably from primitive tools to complex machinery; in Deep Time of the Media, he illuminates turning points of media history-fractures in the predictable-that help us see the new in the old. Drawing on original source materials, Zielinski explores the technology of devices for hearing and seeing through two thousand years of cultural and technological history. He discovers the contributions of "dreamers and modelers" of media worlds, from the ancient Greek philosopher Empedocles and natural philosophers of the Renaissance and Baroque periods to Russian avant-gardists of the early twentieth century. "Media are spaces of action for constructed attempts to connect what is separated," Zielinski writes. He describes models and machines that make this connection: including a theater of mirrors in sixteenth-century Naples, an automaton for musical composition created by the seventeenth-century Jesuit Athanasius Kircher, and the eighteenth-century electrical tele-writing machine of Joseph Mazzolari, among others. Uncovering these moments in the media-archaeological record, Zielinski says, brings us into a new relationship with present-day moments; these discoveries in the "deep time" media history shed light on today's media landscape and may help us map our expedition to the media future.